There are various exciting and tropical Central American destinations that many cruise enthusiasts choose to visit every year – and it’s not surprising why. Central America is filled with an array of jaw-dropping sites to visit and hot, sunny weather that’s sure to keep visitors returning to these shores for many years to come. Key destinations that cruise ships tend to visit include Costa Rica, the Tortuguero canals (Puerto Limon), Cancun, Huatulco and many, many more. Find out about some of these incredible places in more detail below and see if a Central America cruise will be making its way onto your travel wishlist! If you’re seeking a Central American tropical paradise, then you won’t go far wrong with Costa Rica. There’s gorgeous beaches that wouldn’t look out of place on a postcard, lush green forests full of flora, fauna and exotic wildlife plus let’s not forget the remarkable and imposing volcanoes scattered throughout the country. Framed by the ocean, Costa Rica has become renowned world-wide as one of the best scuba diving locations. Home to thousands of different marine species, Costa Rica gives divers the chance to discover shoals of colourful fish, sea turtles and perhaps even a stingray or two! If you like the idea of exploring some of the rain forest whilst you’re in Costa Rica, there are some incredible excursions to choose from. Whether you want to zip line across the rainforest canopy, take a wildlife safari or explore caves and volcanoes – you can take your pick with the variety of life-changing experiences on offer here. Costa Rica is warm all year round with temperatures varying between 21-27 degrees. In the summer, Costa Rica can get incredibly hot, so if you’re out on an excursion remember to bring plenty of water and sun cream. A sun hat and sunglasses are also excursion essentials. Due to the tropical climate, there can be unexpected rainfall of epic proportions so it’s a good idea to bring a waterproof pack up mac and a small microfibre towel in case you get caught in the downfall. Tortuguero is a National Park in the Limon Province of Costa Rica. It’s reachable from Puerto Limon port of call. One of the most popular excursions for this stop is a river cruise along the canals here. The canals offer you a unique perspective for exploring the rainforest. The boats edge quietly through the canals, giving you a greater chance of spotting wildlife like the spectacled caimen and the bare-throated tiger heron. There’s an amazing eleven different types of habitat in the National Park, ranging from mangroves and swamps to beaches and lagoons, giving you an incredible opportunity to explore different landscapes. Cancun in Mexico is perhaps one of the most well-known holiday destinations in Central America, and deservedly so we say! As well as tropical beaches and gorgeous sunny weather, Cancun is home to some magnificent historical sites including the ancient Mayan capital – Chichen Itza. Excursions to the likes of the Chichen Itza really will leave you in awe of the historical architecture and Mayan way of life. Cancun presents plenty of other excursion opportunities. If swimming with dolphins is on your bucket list then you’ll be happy to hear that this is something you can most definitely do in Cancun. 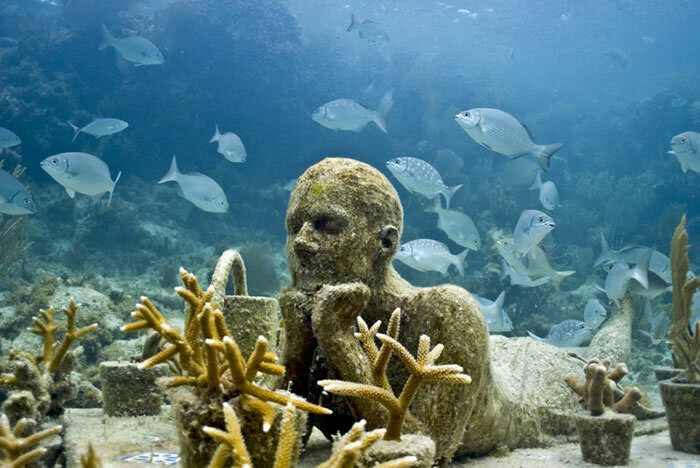 If you’d like to see something truly unique then you could always visit the Cancun underwater museum to see an impressive collection of statues which are bringing art to life as species of coral and sea fauna have started to grow from the sculptures. Like Costa Rica, the weather in Cancun is very warm. In the summer months the temperatures can go as high as 30 degrees and even in what’s considered ‘colder’ weather, temperatures tend to not drop past the high teens. The final destination on our exploration of Central American is Huatulco. This port has been specifically designed for tourists and as a result it has truly excellent provisions and facilities for visitors. Huatulco has a wide stretch of sand which is perfect for a day lazing on the beach and paddling in the crystal clear waters. There are plenty of things to explore when in Huatulco but it’s always worth researching excursions before you depart on your cruise to avoid disappointment. One of the most popular sites in Huatulco is Magic Falls which is like a secret jungle grotto with a waterfall. The weather in Huatulco reaches the 30’s in the summer and this tends to last year round. The average low does vary, dropping to around the 20’s mark in the winter. If you’re interested in cruising to the exotic and enticing Central Americas, then why not see what we have to offer at Cruise Nation? We have a great range of exciting deals that are sure to get you dreaming of your next cruising break in no time at all. To find out more, give us a call on 0800 408 0757. You can also fill in our contact form here and we’ll be in touch shortly. Central America really is a wonderful place, so don’t miss out on the opportunity to explore this stunning landscape during the cruise of a lifetime. To find out more about Cruise Nation and keep up to date with all our latest blog posts and guides then why not follow us on Twitter @Cruisenation? You’ll get access to all our latest deals and cruise information – so don’t miss out! What's Christmas on a Cruise Ship Really Like?